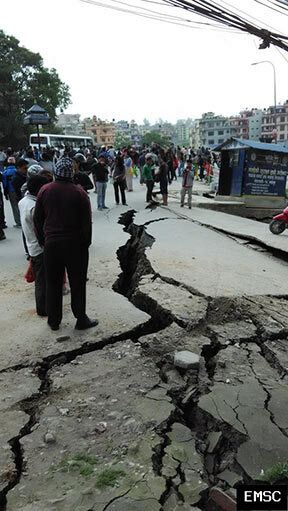 The earthquake, which wreaked havoc in the Kathmandu Valley of Nepal on Saturday about noon local time, was the strongest quake in the world so far this year. With a magnitude of 7.8 it was felt over a very large area from the Indian capital Delhi 500 miles to the west, to Dhaka, the capital of Bangladesh, about the same distance to the southeast. The large quake triggered a major avalanche on the south slopes of Mt. Everest which devastated the base camp, where hundreds of climbers were waiting for a break in the weather to ascend the world's highest peak. More than a dozen people are feared to have died in the avalanche. Mt. Everest lies 140 miles east of the epicenter. The worst damage reported so far occurred in the Nepalese capital Kathmandu, where many buildings collapsed and at least 524 people lost their lives. Police sources spoke of 1000 more deaths in the rural areas of Nepal. 50 more people were killed in northeastern India, and China also reported at least twelve fatalities as a consequence of the quake. One of the reasons for the quake's destructive power was its shallow depth. Calculations by all major earthquake monitoring agencies in the US and Europe put the depth between 7 and 10 miles. Contributing to the devastation was the fact that Kathmandu lies in a basin filled with about 2000 feet of sediments from a former lake. During the shaking of an earthquake, such sedimentary basins tend to amplify the ground motion and thereby increase the destruction. The worst historic effect of this kind led to the huge destruction in Mexico City during an earthquake in 1985. The cause for Saturday's earthquake is the northward movement of the Indian Plate. It crawls with a speed of about 2 inches per year, roughly the same rate with which the Pacific Plate slides past North American in our area. However, the major tectonic difference between California and the Indo-Eurasian plate boundary is the consequence of the plate encounter. When India meets the huge Eurasian Plate, it is forced to dive into the Earth's mantle. This head-on collision also thrusts upwards the Himalayas, making it the highest mountain chain in the world. This plate collision also causes some of the most devastating earthquakes in the world. In the last 125 years, this eastern section of the Himalayan Front alone has seen at least three quakes of magnitude 8 or greater. In 1897 and in 1950 the Indian state of Assam and neighboring Tibet were shaken by quakes with magnitudes of 8.1 and 8.6, respectively. The total death toll for both quakes exceeded 5000. In 1934 Nepal and the neighboring Indian state of Bihar suffered severe damage when an 8.2 quake struck. Almost 20,000 people perished in this quake, most of them in Nepal. This quake destroyed a quarter of all buildings in Kathmandu.